Game Day Preview: The Kelowna Rockets open a three game road trip tonight with a stop in Prince George against the Cougars. The Rockets are 5-0-0-0 in the seasonal series, with two wins in Prince George back on October 6th (7-6 in overtime) and October 7th (4-3 in overtime). The Rockets have out-scored the Cougars 26-19. Three of the five games have been decided by a single goal. Dillon Dube has 5+9=14 in 5 games in the seasonal series. Carsen Twarynski has 7+4=11 in five games while Geordie Ballhorn has a team high +10 in the five games. James Porter has played in three of the five games and has a 2.60 goals against average. Brodan Salmond has appeared in two games and has a goals against average of 5.38. The Rockets are coming off a 6-5 win over the Kamloops Blazers Saturday night. Dillon Dube and Leif Mattson each scored twice in the teams’ 38th win of the season. Overall, the Rockets have points in 22 of their last 30 games (19-8-2-1) and have won three straight overall. The Rockets are in Everett Friday night before welcoming Spokane Saturday at Prospera Place. Broadcasters Notebook: The Rockets have three-30 goal scorers in Carsen Twarynski (38), Kole Lind (32) and Dillon Dube (32). The last time that happened was in the 2008-2009 season when Jamie Benn (46) and Colin Long/Cody Almond (each 33) found the back of the net 30+ times…With 10 games left in the regular season, 5 of the 10 will be played on home ice. The only five road games are in Kamloops, Prince George (twice), Everett and Vancouver…Of the 10 games remaining, 8 are against teams in the BC Division…Cal Foote has 16 goals. The franchise record is 21 set by Madison Bowey in 2014-2015…..The Rockets have 13 shorthanded goals this season, 1 more than all of last season…The team has 23 wins at home, matching their win total from last season at Prospera Place…If Cal Foote and Dillon Dube stay healthy in the next 7 games, they will both reach the 200 games played mark in the exact same game in Kamloops March 9th….Cal Foote has 12 points in his last 8 games…Erik Gardiner returned to the line-up February 9th in Victoria after missing 39 games with an upper body injury….Kole Lind had his 20 game point streak snapped February 3rd in Everett. Lind had 15+23=38 over that period, which was good for the third longest point streak in franchise history. Tyson Barrie had a 21 game point streak in 2009-2010 while the team record is 24 games set by Brett McLean. McLean had 18+31=49 in the 1996-1997 campaign…The Rockets have four hat-tricks this season from Carsen Twarynski (vs. Portland/Prince George), and Kole Lind (PA/Kamloops)…… The Rockets had their 13 game home ice winning streak snapped January 5th vs. Seattle…The Rockets are 7 and 4 in overtime with game winners coming from Kole Lind (twice), Dillon Dube Carsen Twarynski (twice) and Cal Foote (twice). The only losses in OT came against the Tri City Americans, Portland Winterhawks, Red Deer Rebels and Victoria Royals… …Dillon Dube has scored 20+ goals in three consecutive seasons…The Rockets won their 30th game of the season January 24th vs. Lethbridge, marking the 11th straight season the team has achieved that mark. The last time they fell short was in 2006-2007 when the team earned 22 victories….The Rockets are 3-4-2-0 in their last 9 road games….Dillon Dube hit the 200 point mark in his career Friday February 9th in Victoria….Carsen Twarynski is playing in his 88th regular season game as a member of the Rockets. Twarynski has 85 points in those 88 games….The Rockets are 19-5-1-0 against teams in the BC Division…The Rockets have opened the scoring 35 times this season…The opposition has opened the scoring in 5 of the last 9 games…Goaltender Brodan Salmond has started in 5 of the last 6 games and 7 of the last 10…Defenceman James Hilsendager has missed 12 games with an UBI…The Rockets are 6-4-1-1 in 11 games in February…11 of the teams last 16 games have been decided by a single goal. The Rockets are 7-1-2-1 in those 11-one goal games. Streaking: Cal Foote has points in 22 of his last 25 games…Dillon Dube has points in 21 of his last 24 games…Leif Mattson has points in 12 of his last 15 games. Entertaiment value? Close to a 10!! If you didn't like what you witnessed last night at Prospera Place between the Kelowna Rockets and Kamloops Blazers, you have no junior hockey pulse. Zero. None.What a crazy game. Arguably the wackiest game we've witnessed this season, sadly it took until game #62 to finally come to fruition. It featured a significant lead by one team only to see the other roar back with four straight goals. It had power play goals and a shorthanded goal and then an electric finish with the home team scoring the game winning goal with 2:15 remaining on the clock. Rockets 6 - Blazers 5. If that game was served up as a drink at a local pub, I would be clearly asking for a second and likely a third. The coaches will go away thinking the game was awful. From a purely entertainment perspective, it will go down as one of the best, if not the best of the season. The Rockets built up a 3-0 lead and had the game in total command. In typical Kelowna Rockets fashion, they let down their guard and the Blazers stormed back with four straight goals to take a 4-3 lead. Kamloops had very little in the way of quality offensive chances and looked like a team that indeed had scored the 5th fewest goals in the WHL. Passing was poor and the decision making on odd man rushes was frankly terrible. Blazers head coach Don Hay was often grimacing on the bench with what his team was doing. The execution was off. But once they scored the opening goal, the Blazers skill level peaked and no less than two of their goals - one from Luc Smith and another from Nolan Kneen - made them look like one of the highest scoring teams in the league, not one of the lowest. It was crazy how they transformed into such a different looking team once they realized they had a fighting chance. Where did the game change back in the Rockets favour after letting it slip away? My belief is Leif Mattson's shorthanded goal midway through the third period was the TSN turning point. It not only tied the score but it also stopped a string of four consecutive goals by the Blazers. Mattson's backhand attempt on a partial breakaway was stopped by goaltender Dylan Ferguson, but the puck bounced off defender Joe Gatenby's stick and entered the net. It was Mattson's career high 20th of the season and the teams 13th shorthanded. It tied the score at 4. While the Blazers scored a power play goal 21 seconds later to regain the lead at 5-4, it did seem to give the home team a mental boost that they indeed could fight back. Am I the only one concerned about the number of penalties the team took last night? While some are complaining about the officiating, the number of veteran players that took penalties needs to be addressed. That will kill you in a playoff series. In game #62, the older players have to show more restraint. It was a rough night for the officials. The worst call? Blazers forward Luc Smith gets penalized for goaltender interference late in the second period. It was gross. It really was a pathetic call. Ok, let's move on. Dillon Dube was named the 1st star for the third consecutive game. The 19 year-old had two goals in the win, including the opening goal where he used the new WHL kicking rule to its fullest by shin padding the puck into the net on a goal mouth scramble while literally sitting on his rear end. Dube had 5+3=8 in three games this week. Is that good enough to be named WHL Player of the Week? The Rockets have been involved in five consecutive one goal games, including three this week with wins over Prince George (6-5), Seattle (5-4) and Kamloops (6-5). While the team has scored 17 goals in those three games, they have also surrendered 14 against. Yikes! The Rockets clinched a playoff spot in Friday's win over Seattle and matched their win total at home from last season (23) by upending the Blazers Saturday night. More importantly, the team moved 7 points up on Victoria for first place in the BC Division with 10 games remaining in the regular season. Did you notice rookie Marek Skrvne take the face-off in the defensive zone in an effort to preserve the win? Impressive. Skrvne won the draw and the Rockets escaped with the one goal victory. The Rockets handed the Blazers their first regulation loss of the season when leading after 40 minutes. Kamloops was 18-0-1-1 when carrying the lead into the third period. The Rocket trailed 4-3 heading into the third period. The win was only the third time they have come back in 20 attempts this season after training after 40 minutes. What did I think of the rough stuff at the end of the game with Rockets d-man Geordie Ballhorn attempting to nail the puck in the corner as time expired? Would I expect anything less if Blazers forward Jermaine Loewen didn't take an extra run at Ballhorn at the buzzer? Rockets goaltender Brodan Salmond wanted to get his frustration out by leaving his crease and getting into the pile of players that were wanting to scrap. Joe Gatenby was also in the mix in the corner and seemed to be tangled up with Rockets captain Cal Foote. What went on at close quarters was undetectable, but word is Gatenby looked like he was attacked by an alley cat after the two teams went to their respective dressing rooms. The sparks were flying at games end in what can only be described as a junior hockey game that had all the signs of old time hockey. Would I want to see it all the time? No. That said, it was fun to witness on so many levels and we didn't even need a fighting major to keep us entertained. "Hey waiter, can I get another round?" Game Day Preview: The Kelowna Rockets play game three of a four game home stand against the visiting Seattle Thunderbirds. This is the 4th and final meeting of the season between these two teams. The Rockets are 1-2-0-0 after a 6-4 loss (Jan 5th), a 6-2 win (Jan 12th) and a 7-2 loss (Jan19th). These two teams are 7-7-1-0 in their last 15 meetings against one another. Leif Mattson has 3+2=5 against the T-Birds this season while Cal Foote has 0+4=4. The Rockets are coming off a 6-5 win against the Prince George Cougars Tuesday night. Dillon Dube and Carsen Twarynski paced the Rockets with two goals each. Overall, the Rockets have points in 20 of their last 28 games (17-8-2-1). The Rockets welcome Kamloops Saturday night. Broadcasters Notebook: With 12 games left in the regular season, 7 of the 12 will be played on home ice. The only five road games are in Kamloops, Prince George (twice), Everett and Vancouver…Of the 12 games remaining, 10 are against teams in the BC Division…Cal Foote has 15 goals. The franchise record is 21 set by Madison Bowey in 2014-2015…..The Rockets have 12 shorthanded goals this season, the same number they had all of last season…If Cal Foote and Dillon Dube stay healthy in the next 8 games, they will both reach the 200 games played mark in the exact same game in Kamloops March 9th….Cal Foote has 10 points in his last 6 games….The Rockets 21 home ice wins is two shy of the 23 the team recorded last season…Erik Gardiner returned to the line-up February 9th in Victoria after missing 39 games with an upper body injury….Kole Lind had his 20 game point streak snapped February 3rd in Everett. Lind had 15+23=38 over that period, which was good for the third longest point streak in franchise history. Tyson Barrie had a 21 game point streak in 2009-2010 while the team record is 24 games set by Brett McLean. McLean had 18+31=49 in the 1996-1997 campaign…The Rockets have four hat-tricks this season from Carsen Twarynski (vs. Portland/Prince George), and Kole Lind (PA/Kamloops)…The Rockets have sent 17 players to Canada’s roster at the World Junior… The Rockets had their 13 game home ice winning streak snapped January 5th vs. Seattle…The Rockets are 7 and 4 in overtime with game winners coming from Kole Lind (twice), Dillon Dube Carsen Twarynski (twice) and Cal Foote (twice). The only losses in OT came against the Tri City Americans, Portland Winterhawks, Red Deer Rebels and Victoria Royals… …Dillon Dube has scored 20+ goals in three consecutive seasons…The Rockets won their 30th game of the season January 24th vs. Lethbridge, marking the 11th straight season the team has achieved that mark. The last time they fell short was in 2006-2007 when the team earned 22 victories….The Rockets are 3-4-2-0 in their last 9 road games….Dillon Dube hit the 200 point mark in his career Friday February 9th in Victoria….Carsen Twarynski is playing in his 86th regular season game as a member of the Rockets. Twarynski has 82 points in those 86 games….The Rockets are 18-5-1-0 against teams in the BC Division…The Rockets have opened the scoring 34 times this season…The opposition has opened the scoring in 4 of the last 7 games…Goaltender Brodan Salmond has started in three of the last four games and 5 of the last 8…Defenceman James Hilsendager has missed 10 games with an UBI…The Rockets are 4-4-1-1 in 10 games in February…9 of the teams last 14 games have been decided by a single goal. The Rockets are 5-1-2-1 in those 9-one goal games. Streaking: Cal Foote has points in 20 of his last 23 games…Dillon Dube has points in 19 of his last 22 games…Leif Mattson has points in 10 of his last 13 games. Game Day Preview: The Kelowna Rockets play game two of a four game home stand against the visiting Prince George Cougars. The Rockets are 4-0-0-0 in the eight game seasonal series, winning by scores of 7-6 in overtime, 4-3 in overtime, 4-2 and 5-3. These two teams haven’t seen each other since November 29th. Dillon Dube has 3+8=11 in 4 games while Carsen Twarynski has 5+4=9. James Porter Junior has played in three of the four games. The Rockets are 11-3-0-0 in their last 14 regular season meetings between the Cougars. The Rockets are coming off a 3-2 shootout loss Saturday night to the visiting Edmonton Oil Kings. Cal Foote and Braydyn Chizen each scored once in the loss. Overall, the Rockets have points in 19 of their last 27 games (16-8-2-1). The Rockets host Seattle Friday night at Prospera Place before welcoming Kamloops Saturday night. The Rockets visit the Cougars for a double header February 27th and February 28th before the Cougars are back here March 14th. Deadline Ringers: Since the WHL trade deadline, January 10th, this is how the Rockets top players have performed. Cal Foote and Kole Lind each have 26 points. Kind has 11+15=26 while Foote has 9+17=26. Dillon Dube has 9+11=20 while Leif Mattson has 7+12=19. Carsen Twarynski has 8+7=15 since trades were consummated. Broadcasters Notebook: With 13 games left in the regular season, 8 of the 13 will be played on home ice. The only five road games are in Kamloops, Prince George (twice), Everett and Vancouver…Of the 13 games remaining, 10 are against teams in the BC Division…Cal Foote has 15 goals. The franchise record is 21 set by Madison Bowey in 2014-2015…..If Cal Foote and Dillon Dube stay healthy in the next 9 games, they will both reach the 200 games played mark in the exact same game in Prince George….Cal Foote has 8 points in his last 5 games….The Rockets 20 home ice wins is the second most of any team in the Western Conference (tied with Victoria). The Everett Silvertips have 22 home ice victories…Erik Gardiner returned to the line-up February 9th in Victoria after missing 39 games with an upper body injury.…. Kole Lind had his 20 game point streak snapped February 3rd in Everett. Lind had 15+23=38 over that period, which was good for the third longest point streak in franchise history. Tyson Barrie had a 21 game point streak in 2009-2010 while the team record is 24 games set by Brett McLean. McLean had 18+31=49 in the 1996-1997 campaign…The Rockets have four hat-tricks this season from Carsen Twarynski (vs. Portland/Prince George), and Kole Lind (Prince Albert/Kamloops)…The Rockets have sent 17 players to Canada’s roster at the World Junior… The Rockets had their 13 game home ice winning streak snapped January 5th vs. Seattle…The Rockets are 7 and 4 in overtime with game winners coming from Kole Lind (twice), Dillon Dube Carsen Twarynski (twice) and Cal Foote (twice). The only losses in OT came against the Tri City Americans, Portland Winterhawks, Red Deer Rebels and Victoria Royals… …Dillon Dube has scored 20+ goals in three consecutive seasons…The Rockets won their 30th game of the season January 24th vs. Lethbridge, marking the 11th straight season the team has achieved that mark. The last time they fell short was in 2006-2007 when the team earned 22 victories….The Rockets are 3-4-2-0 in their last 9 road games….Dillon Dube hit the 200 point mark in his career Friday February 9th in Victoria….Carsen Twarynski is playing in his 85th regular season game as a member of the Rockets. Twarynski has 80 points in those 85 games….The Rockets are 17-5-1-0 against teams in the BC Division…The Rockets have opened the scoring 33 times this season…The opposition has opened the scoring in 4 of the last 6 games. Streaking: Cal Foote has points in 19 of his last 22 games…Dillon Dube has points in 18 of his last 21 games…Leif Mattson has points in 10 of his last 12 games. You could sense it. The Kelowna Rockets were hosting the last place Edmonton Oil Kings Saturday night and the probability of an upset was looming large. After being beaten by the Red Deer Rebels, a non-playoff team, Wednesday night and then being just good enough Friday in squeezing out a 2-1 win in Kamloops, the general consensus was the Oil Kings, with 34 fewer points, would storm into Prospera Place and would have a legitimate shot of leaving the building with two points. That's exactly what they did. Frankly, right now, the Rockets aren't that good. Many are wondering why. Is it fatigue? Is it taking the opponent lightly? The team has injuries to three key veterans, but the Oil Kings, who had nothing to play for outside of pride, were limping into the final game of a four game road trip with just 10 forwards. 10!! This should have been an easy two points for the home team. That's the problem. The Rockets thought it would be easy and they paid the price in a 3-2 shootout loss. For essentially the third straight game, the Rockets played a near picture perfect perimeter game. Perimeter isn't good people. Perimeter is bad. Playing on the outside results in little to no secondary chances on net. It really is lazy hockey to be frank. The forwards don't want to skate hard enough to rebounds because it takes effort. The lazy or easy way is to enter the zone, fire pucks on goal and hope you can beat the goalie. Goals from Cal Foote and Braydyn Chizen were scored that way. I thought Oil Kings goalie Todd Scott, who was particularly good in the shootout, was a rebound guilty machine but the Rockets forwards couldn't get to those secondary chances. The question is why? Puck retrieval must improve. That area in the offensive zone has been weak in the last three games. I will say the Oil Kings looked significantly better than when we saw them earlier this season in a 5-2 loss at Prospera Place. They look more structurally sound. Oh sure, a team with 18 wins will make many glaring errors, but they didn't look as fractured in their overall play as they did in November. Give the players and the coaches credit for coming into Kelowna and essentially outworking the Rockets. They could have mailed it in with little to nothing to play for, yet they found a common cause to rally around - PRIDE - and earned two points in a building they had come away empty handed in their last seven visits. Cal Foote, Mr. Everything scored his 15th goal of the season. The 19 year-old is edging into some elite company when it comes to scoring goals from the blue-line. Madison Bowey has the team record with 21. Tyson Barrie had 19. Scott Hannan had 17 goals. Mark my words people, Cal Foote should get heavy consideration for team MVP. Tomas Soustal had to leave Prospera Place with a huge grin on his face. Soustal scored the tying goal in the second period by finding the back of the net with his 16th. A member of the 2015 WHL championship team, the 20 year-old was named the 1st star and received a nice applause from the hometown crowd, who had little to cheer for in the teams 28th home ice game of the season. Say what you want about Trey Fix-Wolansky, but I thought he played a determined game. Often taking bad penalties which can hurt his team, he was clearly noticeable as one of the Oil Kings top players. Fix-Wolasky plays hard, hits and likes to shoot. How d-man Connor McDonald has only 5 goals this season is beyond me? I thought he was terrific. The only ugly part in his game is the stat line that reads -11. But when you give up a league high 250 goals against, the +/- will take a massive kicking. Losing back-to-back games at Prospera Place has been rare this season. That said, the team did go four consecutive games without a win back in October. In fact, after losing in a shootout to Everett, the team lost three consecutive games to Victoria, Calgary and Portland. Despite the less than favourable results, the team still earned 3 out of a possible 4 points on the weekend and remain one point up on Victoria in the fight for first place in the BC Division with 13 games remaining. The next test is a Tuesday match up against playoff-less Prince George, a team that would like nothing more than to follow in the footsteps of the Rebels and Oil Kings and upset the apple cart. Game Day Preview: The Kelowna Rockets have just six games left on the road this season. The team faces the Kamloops Blazers in the 5th of 8 meetings between these two teams. Having not seen each other since way back on December 29th, the Rockets are 4-0-0-0 in the seasonal series with wins of 6-2, 5-1, 2-1 in a shootout and 3-0. The Rockets are coming off a 4-1 loss to the Red Deer Rebels Wednesday night. Despite firing 37 shots on goal, only Kyle Topping was able to score in the teams 6th loss on home ice this season. Overall the Rockets have out-scored the Blazers 16-4 with games tonight, February 24th, March 9th and March 10th. Overall, the Rockets have points in 17 of their last 25 games (15-8-2-0). The Rockets host the Edmonton Oil Kings tomorrow night before welcoming Prince George on Tuesday and Seattle one week from tonight at Prospera Place. Broadcasters Notebook: With 15 games left in the regular season, 9 of the 15 will be played on home ice. The only six road games are in Kamloops (twice), Prince George (twice), Everett and Vancouver…The Rockets 20 home ice wins is the second most of any team in the Western Conference (tied with Victoria). The Everett Silvertips have 21 home ice victories…The Rockets and Victoria Royals were fined $500.00 each for a fight between Kyle Pow and Braydon Buziak in Monday’s game…Erik Gardiner returned to the line-up February 9th in Victoria after missing 39 games with an upper body injury.…. Kole Lind had his 20 game point streak snapped February 3rd in Everett. Lind had 15+23=38 over that period, which was good for the third longest point streak in franchise history. Tyson Barrie had a 21 game point streak in 2009-2010 while the team record is 24 games set by Brett McLean. McLean had 18+31=49 in the 1996-1997 campaign….James Porter was named the WHL and CHL Goaltender of the Week ending December 31st after posting a 2-0-0-0 record including one shutout with a goals against average of 0.48 and a save percentage of .987…The Rockets have four hat-tricks this season from Carsen Twarynski (vs. Portland/Prince George), and Kole Lind (Prince Albert/Kamloops)…The Rockets have sent 17 players to Canada’s roster at the World Junior… The Rockets had their 13 game home ice winning streak snapped January 5th vs. Seattle…The Rockets are 7 and 3 in overtime with game winners coming from Kole Lind (twice), Dillon Dube Carsen Twarynski (twice) and Cal Foote (twice). The only losses in OT came against the Tri City Americans, Portland Winterhawks, Red Deer Rebels and Victoria Royals……NHL Central Scouting has released its mid-term rankings. Forward Kyle Topping is rated 65th among North American skaters. Defenceman Libor Zabransky is rated 110th…Dillon Dube has scored 20+ goals in three consecutive seasons. Dube had 20 goals last season in 40 games and had a career high 26 in 2015-2016.…The Rockets won their 30th game of the season January 24th vs. Lethbridge, marking the 11th straight season the team has achieved that mark. The last time they fell short was in 2006-2007 when the team earned 22 victories…Liam Kindree is missing his 21st straight game with a lower body injury. Digg’n Deeper: Kole Lind reached the 30 goal mark Monday in a win over Victoria. The 19 year-old is the first Rockets player since Tyson Ballie to score 30+ goals in back-to-back seasons. Baillie had 37 goals as a 19 year-old and scored 43 times as a 20 year-old…The Rockets are 2-4-2-0 in their last 8 road games….Dillon Dube hit the 200 point mark in his career Friday February 9th in Victoria….Carsen Twarynski is playing in his 83rd regular season game as a member of the Rockets. Twarynski has 80 points in those 83 games….The Rockets are 15-5-1-0 against teams in the BC Division…The Rockets have opened the scoring 31 times this season…The opposition has opened the scoring in 4 straight games. Streaking: Cal Foote has points in 17 of his last 20 games…Dillon Dube has points in 17 of his last 19 games…Leif Mattson has points in 9 of his last 10 games. One! Gordie Ballhorn now has one. One game winning goal in 159 career games in the Western Hockey League over three seasons. The 20 year-old defenceman is having a career year offensively with 30 points, nearly twice his total (18) from the two previous seasons combined. Ballhorn's blast from the blue-line, on the power play in the second period, stood up as the game winner in a 5-4 win Monday afternoon against the arch rival Victoria Royals. It was Ballhorn's first goal in 17 games. I don't think any of the 5 thousand, 625 fans thought it would be the game winning goal at the time with the home team enjoying a 5-2 lead. The Royals, a determined bunch, scored two straight goals to make everyone nervous, before time expired as the Rockets earned their 20th home ice win of the season. Dillon Dube and Kole Lind each chipped in with three points as the Rockets moved back into sole possession of first place in the BC Division, one point up on the Royals while holding two games in hand. The hit. Let's discuss the hit that sent Kelowna Rockets leading point producer Kole Lind to the dressing room. It happened in the second period after Lind was hit hard in front of the Royals net by defenceman Ralph Jarratt. Lind, skating on right wing, made one last move at the right face-off circle, and with his eyes squarely looking for a hole behind goaltender Griffin Outhouse, was blindsided by Jarratt with a huge hit. It sent the 30 goal scorer air-born before crashing onto the ice. No penalty was called on the play. Lind stayed motionless on the ice for no less than two minutes before being helped off the ice. Usually hits like these have Lind gathering his composure and skating away. Not this time. Lind, with the help of teammates, made his way to the dressing room in what can only be described as a fog. After looking at the hit on video, you can't help but notice Jarratt leaving his skates either before or during impact. Regardless, the 6'2, 223 pound blue-line saw a vulnerable player and laid a licking on him. Is the hit suspendable? Without a shadow of a doubt. Should Lind have opened himself up to the possibility of being hit hard in his attempt to score a goal? Probably not, but if Jarratt keeps his skates on the ice and doesn't attempt to take Lind's head off, a suspension isn't warranted and Lind is shaken up, but otherwise ok. The game was full of emotion. You could feel it prior to puck drop considering these two arch rivals were facing one another for the third time in four days. It started with a bang when 10 seconds into the opening face-off, Rockets rookie Kyle Pow dropped the gloves with Royals forward Braydon Buziak. Buziak has 20 career WHL fights to his credit while Pow leads his team with 7. Both were immediately ejected from the game for not participating in the play, instead wanting to set the tone by trading punches with one another. The win came at a cost. Not only did the Rockets lose Kole Lind to injury, starting goaltender James Porter Junior was hurt in a goal mouth collision in the third period with Royals forward Andrei Grishakov. Dillon Dube, back checking, appeared to make contact with Grishakov, sending him sailing into Porter, who's only focus at the time was keeping the puck out of the net, not looking at anyone coming at him from the side. Porter, suffering what appeared to be a lower body injury, was also helped off the ice and was replaced by backup Brodan Salmond. Let's hope Porter is ok and the Rockets have 15 year-old Cole Tisdale's phone number on speed dial. Cal Foote was again a huge force for the Rockets in the one goal win. Seemingly never leaving the ice, the 19 year-old was so good at both ends. I can't say enough about his terrific play. Playing against the teams top players, used on the power and on the penalty kill, the first round NHL draft pick of the Tamapa Bay Lightning must have played 30 minutes - easy! What you may not notice is how many times he bails out his defensive partner, who makes a terrible read and often escapes trouble with tremendous body positioning and a calm deameanor. I'd argue, Cal Foote could be considering for the team MVP award for his stellar play at both ends of the ice. Kole Lind and Dillon Dube will catch your eye in the offensive zone, but Foote does it with consistency at both ends. We are often astonished when he makes a bad play, because he rarely ever does. I see him play every night, and in my mind he is a WHL Western Conference all-star. Whether it's a first or second team all-star, Cal Foote is a stud. Carsen Twarysnki scored his 35th goal of the season in the victory. Again, playing as physical as any forward on both teams rosters, I thought the 20 year-old was terrific with his aggressive play. Twarynski's forehand to backhand move for his goal shows what type of hands he possesses. If he can score 40, which he will with 15 games left in the regular season, he will become the first player since Tyson Baillie (43) to do so. Have you seen an improvement in Connor Bruggen-Cate's overall play? It is really neat to see him finally making an impact with more consistent play. From three goals last season to 16 this season is a massive improvement. Something happened over the Christmas break. Since then the soft spoken forward has 10 goals and 6 assists. Leif Mattson is riding a 5 game point streak after an assist. Can you imagine if the Rockets and Royals met in a playoff series? It would be a blood bath. These two organizations detest one another. The Rockets host the Red Deer Rebels Wednesday. Look out for the Rebels, who had been struggling until beating the Rockets January 27th in overtime. Since then, Brett Sutter's group have been winning consistently and looking nothing like they did when they went through a stretch where they were losing on a consistent basis. Game Day Preview: The Kelowna Rockets and Victoria Royals meet for the third time in four days with a matinee affair at Prospera Place on this BC Family Day. 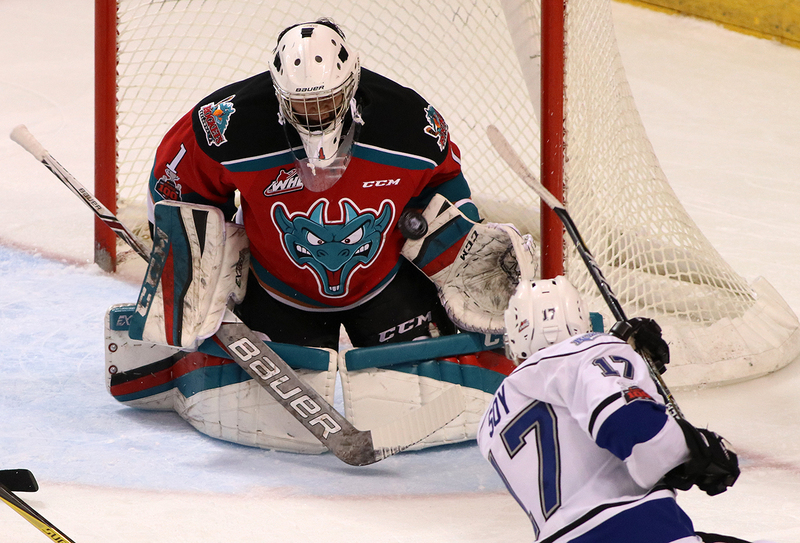 The Rockets and Royals met on the weekend in Victoria with the Royals winning Friday in regulation time before earning an overtime victory Saturday. In Friday’s game, the Royals erupted for three power play goals in a 6-1 win. Tyler Soy had 1+3=4 in the victory while Dillon Dube scored the lone goal for the Rockets in the loss. In Saturday’s rematch, Cal Foote had a goal and an assist in a 4-3 overtime loss. Tanner Kaspick scored the game winner on the power play when Kyle Topping was fingered to the penalty box for tripping. Kole Lind and Connor Bruggen-Cate also scored in the teams’ 4th overtime loss of the season. Overall, the Rockets have points in 16 of their last 23 games (14-7-2-0). The Rockets host Red Deer Wednesday and travel to Kamloops Friday before hosting the Edmonton Oil Kings on Saturday February 17th. Broadcasters Notebook: Erik Gardiner returned to the line-up Friday in Victoria after missing 39 games with an upper body injury…James Porter Junior received the start in goal Saturday after missing 12 straight games with an upper body injury.…. Kole Lind had his 20 game point streak snapped last Saturday in Everett. Lind had 15+23=38 over that period, which was good for the third longest point streak in franchise history. Tyson Barrie had a 21 game point streak in 2009-2010 while the team record is 24 games set by Brett McLean. McLean had 18+31=49 in the 1996-1997 campaign….James Porter was named the WHL and CHL Goaltender of the Week ending December 31st after posting a 2-0-0-0 record including one shutout with a goals against average of 0.48 and a save percentage of .987…The Rockets have four hat-tricks this season from Carsen Twarynski (vs. Portland/Prince George), and Kole Lind (Prince Albert/Kamloops)…The Rockets have sent 17 players to Canada’s roster at the World Junior… The Rockets had their 13 game home ice winning streak snapped January 5th vs. Seattle…The Rockets are 7 and 3 in overtime with game winners coming from Kole Lind (twice), Dillon Dube Carsen Twarynski (twice) and Cal Foote (twice). The only losses in OT came against the Tri City Americans, Portland Winterhawks, Red Deer Rebels and Victoria Royals……NHL Central Scouting has released its mid-term rankings. Forward Kyle Topping is rated 65th among North American skaters. Defenceman Libor Zabransky is rated 110th…Dillon Dube has scored 20+ goals in three consecutive seasons. Dube had 20 goals last season in 40 games and had a career high 26 in 2015-2016.…The Rockets won their 30th game of the season January 24th vs. Lethbridge, marking the 11th straight season the team has achieved that mark. The last time they fell short was in 2006-2007 when the team earned 22 victories…Liam Kindree is missing his 19th straight game with a lower body injury. Digg’n Deeper: Kole Lind is one goal shy of 30. If he reaches that mark, the 19 year-old will be the first Rockets player since Tyson Ballie to score 30+ goals in back-to-back seasons. Baillie had 37 goals as a 19 year-old and scored 43 times as a 20 year-old…The Rockets are 2-4-2-0 in their last 8 road games….Dillon Dube hit the 200 point mark in his career Friday February 9th in Victoria….Carsen Twarynski is playing in his 81st regular season game as a member of the Rockets. Twarynski has 79 points in those 81 games….The Rockets are 14-5-1-0 against teams in the BC Division…The Rockets have opened the scoring 31 times this season…Kole Lind has 3 goals in the seasonal series against the Royals. Can you lose 6-1 and not play that badly? Sounds crazy right? My belief is that is exactly what happened Friday night in a loss to the Victoria Royals. Missed chances in the offensive zone and several trips to the penalty box where the Kelowna Rockets undoing. No less than two posts were hit by the visitors when the game was close, before the Royals scored two-second period goals to turn a 2-1 game into a 4-1 lead after 40 minutes. Tyler Soy had 1+3=4, but it was three 'blue paint' goals that stood out for me as the deciding factor in the five goal loss. On three separate occasions, the Royals were able to sneak pucks past starter Brodan Salmond from essentially two feet. Matthew Phillips failed on his first attempt when he received a nice backdoor pass but couldn't tuck the puck in when the far post got into his way and the game remained scoreless. It was a sign of things to come. The Royals feast on the backdoor feeds at the side of the net or create scoring chances from the lip of the crease. Dante Hannoun opened the scoring on the power play that way on a backdoor feed. Andrei Grishakov made it 3-1, again with a tap-in on a nice setup from Tanner Kaspick. Matthew Phillips made it 4-1 with a feed at the lip of the crease. Those three goals were almost identical. The Rockets need to do a better job of defending. In fact, of the 6 goals surrendered last night, all of them came from within 8 feet or closer of the net. Some would suggest that is how all goals are scored. Maybe at the NHL level, but not in major junior. Again the Rockets had their chances, specifically when the game was in reach in the second period. During a goal mouth scramble, leading goal scorer Carsen Twarynski battled in front of the Royals net, had goaltender Griffin Outhouse down, but fired the puck into the back of the 19 year-olds left skate. The puck then ricocheted off that skate and teetered on the goal line before being swept away. It was one of those night's where the road team had absolutely no puck luck. The Rockets also had a 4 minute power play in the second period when Royals forward Braydon Buziak was given a double minor for slew footing Rockets defenceman Braydyn Chizen. In a 1-0 game, the Rockets could have equaled the score but couldn't find the back of the net. I thought the unit generated scoring chances, so it wasn't like it was a complete waste, but again, it didn't produce while the Royals did with three extra man goals. Holding your cool is anything but easy when things aren't going your way. At games end the Rockets took 8 trips to the penalty box, allowing the Royals to score its league leading 66th, 67th and 68th power play goals of the season. Let's give props to Jack Cowell. The second year forward was absolutely crushed on two separate occasions last night and didn't miss a shift. Cowell was hammered by d-man Cade Jensen in the first period and then took another run at him in the second period which was called a penalty for interference. I'm not a fan of Jensen's defensive work (hello -49 over his career) but you have to love his ability to physically punish an opponent. I find it a lost art among today's blue-liner. It was nice to see Erik Gardiner in the line up after a 39 game absence. The 18 year-old kept his shifts extremely short in the first period and lengthened them as the game went along. For a player missing in game action since October 28th, I thought he played very well. It was also nice to see James Porter Junior back in the line-up. Missing 11 games with an upper body injury, Porter came into the game in the third period in a relief appearance of Brodan Salmond. I am assuming the goaltending change had more to do with getting Porter some actual playing time with the likelihood of him starting in Saturday's rematch. Porter surrendered two-third period goals after Salmond allowed 4 goals on 25 shots. Salmond has been pulled five times this season. Conclusion? Missed opportunities were the Rockets downfall. I thought they played with good pace through 40 minutes before the Royals took the game over late in the second period and throughout the third. By then the game was lost, or in the Royals case, won. Don't let the score fool you. In the seasonal series, the Rockets and Royals have each earned three wins against one another. They are more evenly matched than last night's scoreboard indicated. Join me tonight at 6 pm on AM 1150 for another edition of The Kelowna Rockets This Week. We speak with Rick Ball, the first radio voice of the team when they relocated from Tacoma to Kelowna for the start of the 1995-1996 season. Ball is now the TV play-by-play man for the NHL's Calgary Flames. You can blame him for leaving and allowing me to take his spot for the last 18 seasons. Game Night Preview: Call it a best of three. 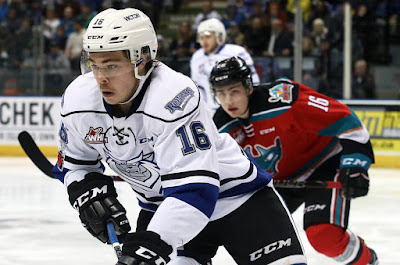 In a quirk in the WHL schedule, the Kelowna Rockets face the Victoria Royals in three consecutive games, with two in Victoria tonight and tomorrow followed by a matinee affair in Kelowna Monday afternoon (2 pm). The Rockets are 2-1-0-0 at home and 1-1-0-0 on the road for an overall record of 3-2-0-0 in five of the eight meetings. In the last engagement, January 20th, the Rockets were 8-4 winner. The Rockets are coming off a 4-1 win over the Vancouver Giants Wednesday night. Kole Lind and Carsen Twarynski each had 1+1=2 in the victory. Brodan Salmond earned the win in goal with a 25 save performance. Overall, the Rockets have points in 15 of their last 21 games (14-6-1-0). The Rockets are opening a portion of their schedule playing 6 games in 9 nights. After these two games in Victoria, the Rockets host the Royals this Monday, Red Deer next Wednesday, travel to Kamloops Friday February 16th before hosting the Edmonton Oil Kings on Saturday February 17th. Broadcasters Notebook: Kole Lind had his 20 game point streak snapped last Saturday in Everett. Lind had 15+23=38 over that period, which was good for the third longest point streak in franchise history. Tyson Barrie had a 21 game point streak in 2009-2010 while the team record is 24 games set by Brett McLean. 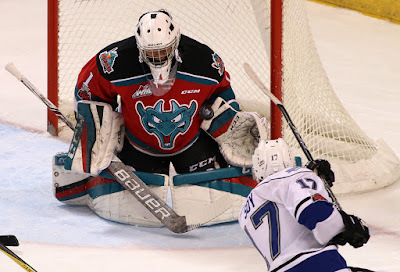 McLean had 18+31=49 in the 1996-1997 campaign…The Rockets have 20 wins in their last 28 games….James Porter was named the WHL and CHL Goaltender of the Week ending December 31st after posting a 2-0-0-0 record including one shutout with a goals against average of 0.48 and a save percentage of .987…The Rockets have four hat-tricks this season from Carsen Twarynski (vs. Portland/Prince George), and Kole Lind (Prince Albert/Kamloops)…The Rockets have sent 17 players to Canada’s roster at the World Junior… The Rockets had their 13 game home ice winning streak snapped January 5th vs. Seattle…The Rockets are 7 and 3 in overtime with game winners coming from Kole Lind (twice), Dillon Dube Carsen Twarynski (twice) and Cal Foote (twice). The only losses in OT came against the Tri City Americans, Portland Winterhawks and Red Deeer Rebels….Erik Gardiner has missed 39 games after being injured October 28th vs. Prince George…: NHL Central Scouting has released its mid-term rankings. Forward Kyle Topping is rated 65th among North American skaters. Defenceman Libor Zabransky is rated 110th…Dillon Dube has scored 20+ goals in three consecutive seasons. Dube had 20 goals last season in 40 games and had a career high 26 in 2015-2016.…The Rockets won their 30th game of the season January 24th vs. Lethbridge, marking the 11th straight season the team has achieved that mark. The last time they fell short was in 2006-2007 when the team earned 22 victories…Liam Kindree is missing his 17th straight game with a lower body injury…Goaltender James Porter has missed 11 games with an upper body injury. The 17 year-old’s last start was against the Giants January 13th. Streaking: Cal Foote has points in 14 of his last 16 games…Dillon Dube has points in 14 of his last 15 games…Carsen Twarynski has 5 goals in his last 8 games…Leif Mattson has 4 goals in his last 8 games. Milestones: Nolan Foote played in his 100th career game February 3rd vs. Everett….Kole Lind has 203 career points ….Dillon Dube has 199 career points, two shy of 200…;Connor Bruggen-Cate played in his 100th game December 30th vs. Victoria…Kyle Topping played in his 100th career game January 10th…Jack Cowell played in his 100th career game January 12th in Seattle…Head Coach Jason Smith coached his 100th career regular season game against the Kootenay Ice on December 2nd…Carsen Twarynski played in his 200th career game October 28th against the Prince George Cougars…James Hilsendager played in his 200th career game November 14th vs. Oil Kings. Game Night Preview: The Kelowna Rockets face the Vancouver Giants for the 5th of 8 times this season. The Rockets are 2-2-0-0 with the home team winning three of the four games. Of the four, three have been played in Vancouver/Langley. The Giants make a return visits March 7th and 17th. The Rockets last visit to the Langley Events Centre is March 16th. Three of the four games have been decided by a goal. The only blowout was a 6-1 win for the Giants on November 18th. Carsen Twarynski has 2+2=4 in the four game seasonal series while Cal Foote has 0+4=4. Tyler Benson has 4+2=6 in the four games for the Giants. The Rockets are coming off an 8-2 loss to the Everett Silvertips Saturday with Cal Foote scoring both goals in the setback. Overall, the Rockets have points in 14 of their last 20 games (13-6-1-0). The Rockets play 15 of their final 20 against teams in the BC Division. The Rockets are in Victoria Friday and Saturday night before returning to meet the Royals on Monday (February 12th) in matinee affair at Prospera Place. Broadcasters Notebook: Kole Lind had his 20 game point streak snapped Saturday night in Everett. Lind had 15+23=38 over that period, which was good for the third longest point streak in franchise history. Tyson Barrie had a 21 game point streak in 2009-2010 while the team record is 24 games set by Brett McLean. McLean had 18+31=49 in the 1996-1997 campaign…The Rockets have 20 wins in their last 28 games….James Porter was named the WHL and CHL Goaltender of the Week ending December 31st after posting a 2-0-0-0 record including one shutout with a goals against average of 0.48 and a save percentage of .987…The Rockets have four hat-tricks this season from Carsen Twarynski (vs. Portland/Prince George), and Kole Lind (Prince Albert/Kamloops)…The Rockets have sent 17 players to Canada’s roster at the World Junior… The Rockets had their 13 game home ice winning streak snapped January 5th vs. Seattle…The Rockets are 7 and 3 in overtime with game winners coming from Kole Lind (twice), Dillon Dube Carsen Twarynski (twice) and Cal Foote (twice). The only losses in OT came against the Tri City Americans, Portland Winterhawks and Red Deeer Rebels….Erik Gardiner has missed 38 games after being injured October 28th vs. Prince George…: NHL Central Scouting has released its mid-term rankings. Forward Kyle Topping is rated 65th among North American skaters. Defenceman Libor Zabransky is rated 110th…Dillon Dube has scored 20+ goals in three consecutive seasons. Dube had 20 goals last season in 40 games and had a career high 26 in 2015-2016.…The Rockets won their 30th game of the season January 24th vs. Lethbridge, marking the 11th straight season the team has achieved that mark. The last time they fell short was in 2006-2007 when the team earned 22 victories…Liam Kindree is missing his 16th straight game with a lower body injury…Goaltender James Porter has missed 10 games with an upper body injury. The 17 year-old’s last start was against the Giants January 13th. ..
Streaking: Cal Foote has points in 13 of his last 15 games…Dillon Dube has points in 13 of his last 14 games…Carsen Twarynski has 4 goals in his last 7 games…Leif Mattson has 4 goals in his last 7 games. Milestones: Nolan Foote played in his 100th career game February 3rd vs. Everett….Kole Lind has 201 career points ….Dillon Dube has 198 career points, two shy of 200…;Connor Bruggen-Cate played in his 100th game December 30th vs. Victoria…Kyle Topping played in his 100th career game January 10th…Jack Cowell played in his 100th career game January 12th in Seattle…Head Coach Jason Smith coached his 100th career regular season game against the Kootenay Ice on December 2nd…Carsen Twarynski played in his 200th career game October 28th against the Prince George Cougars…James Hilsendager played in his 200th career game November 14th vs. Oil Kings. What is the takeaway from back-to-back losses to the Everett Silvertips on the weekend? While the Kelowna Rockets have elite individual skill, the Tips play a far superior team game. It was evident in a 3-2 loss Friday and was punctuated Saturday in a 8-2 trouncing. The Tips have something the Rockets don't have right now - a sustained work ethic throughout the entire line-up. I'm not saying that the Tips don't have skill. Far from it. But what makes them superior is all 18 skaters battle to retrieve loose pucks, defend beyond belief and do the little things that don't only bring regular season success, but long term success in the playoffs. Some will suggest that formula didn't work last season as they were eliminated by the Seattle Thunderbirds in the opening round. Let's remember though, the T-Birds have a eerily similar work ethic to that of the Tips and had a player like Mathew Barzal. Enough said. Assistant Coach Travis Crickard brought the issue of work ethic/playing as a team as opposed to individual skill on our post game show last night. It was something I thought was happening, but honestly was hoping it wasn't true. In several games this season, superior talent in the form of Kole Lind, Dillon Dube, Cal Foote and Carsen Twarynski have single handily earned wins. Individual skill has prevailed, but mainly against inferior competition. What we saw this weekend against Everett was a very low 'team concept' approach to the game. The end result was back-to-back losses. I'd go as far as to suggest the Tips play the most complete 'team game' of anyone on the 22 team circuit. They are not a one trick pony as many believe despite having the CHL's best goaltender. It goes far beyond Carter Hart. The team defends extremely well and kept the Rockets to the outside in the offensive zone. Nobody has done that to the Rockets in back-to-back games like the Tips did. Nobody. How many secondary chances did the Tips give up on the weekend? Five maybe? Whether it was a forward or defenceman, they were first to loose pucks, initiated contact and won 90% of the battles to get it back on their stick. They looked stronger, but it wasn't brute strength that prevailed. It is greater determination to play hard for one another, making them superior to a Rockets team that has earned recent wins on late rallies and clutch play from top end players. Can it be fixed? Sure it can. It needs too, or like Crickard said in his post game comments, the season will end like it has the last two seasons with exits from a team that may have superior individual skill, but are punted from the playoffs by an opponent who plays a significantly better team game. The good news is the Rockets have a month to get it right before meeting the Tips again on March 2nd. Making matters worse, second year forward Nolan Foote was injured in the first period of Saturday's game and will be sidelined for a significant amount of time. Playing in his 100th career game Saturday night, the 17 year-old provides the team with a threat on the power play with his laser beam release and adds significant depth on a team that has little in the way or scoring bunch in its bottom six forwards. With Erik Gardiner and Liam Kindree still out with injuries, the top six will be relied on heavily to generate offense. I thought Cal Foote was terrific. In a 8-2 blowout, I was surprised that whoever picked the three stars in Everrett elected to give him the honour. Not because he didn't deserve it, but in the home arena in a 6 goal differential, typically that doesn't happen. I thought Cal Foote was the best player wearing a Rockets uniform Saturday night at both ends of the ice. Foote recorded his first two goal game of his career and was equally as good at the other end of the ice. Logging additional ice time with veteran James Hilsendager out with an upper body injury sustained Tuesday on a blindside hit by Tigers forward Ryan Chyzowski, the team captain continues to show he is world class. Kole Lind had his 20 game point streak snapped Saturday night. It was a great run for the 19 year-old, who has failed to hit the score-sheet only five times this season. My vote for team MVP, I thought Lind's streak would continue late in the game when the Rockets were awarded a power play. Lind, at the left face-off circle, sent a picture perfect pass to Dillon Dube, who whiffed on a one-timer at the right face-off circle on what appeared to be a sure goal had it been executed to perfection. In the three games against the Tips, neither Lind or Dube have scored a goal. By contrast, leading scorer Patrick Bajkov had 4+3=7 in the two games on the weekend and was a difference maker at both ends of the ice. The back-to-back losses are the first for the team since losing three in a row on a prairie road trip which saw the team fall in Brandon, lose in Moose Jaw before suffering a 5-1 loss in Swift Current. The Rockets power play went 0 for 5 on the weekend against a Tips team that owns the best penalty killing unit in the WHL. Everett's power play went 5 for 10. I thought it was a pretty solid weekend for 16 year-old rookie d-man Cayde Augustine. A listened player who made his debut Friday because of the injury to James Hilsendager, the 6'2, 220 pound blue-liner faced a top tier team and fared quite well. Wearing Luke Schenn's old #5, the Airdrie, Alberta resident ended the weekend with a +/- rating of 0. The Rockets entered the weekend with a one point lead on the Tips for first place in the Western Conference. The team exits the weekend now three points back. Now in a two way tie for first in the BC Division with the Victoria Royals, the Rockets play 15 of their final 20 regular season games against teams in the BC Division. It all starts Wednesday at home against hard charging Vancouver.